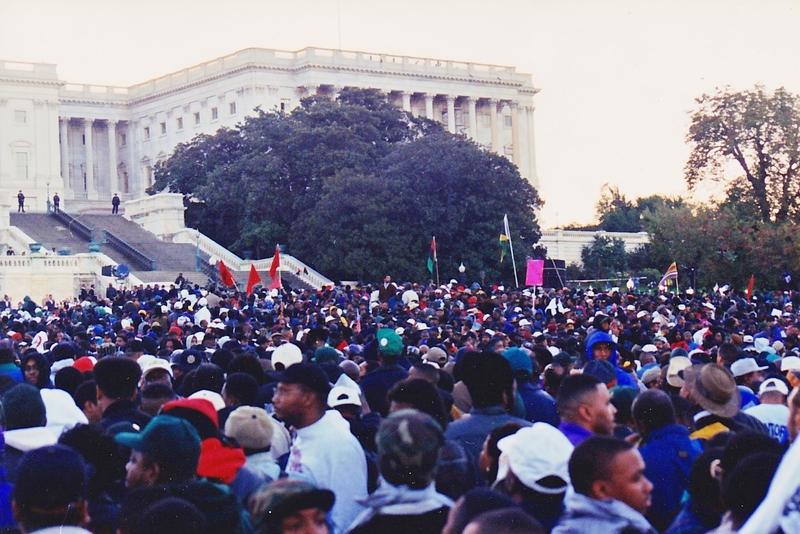 Million Man March 1995. 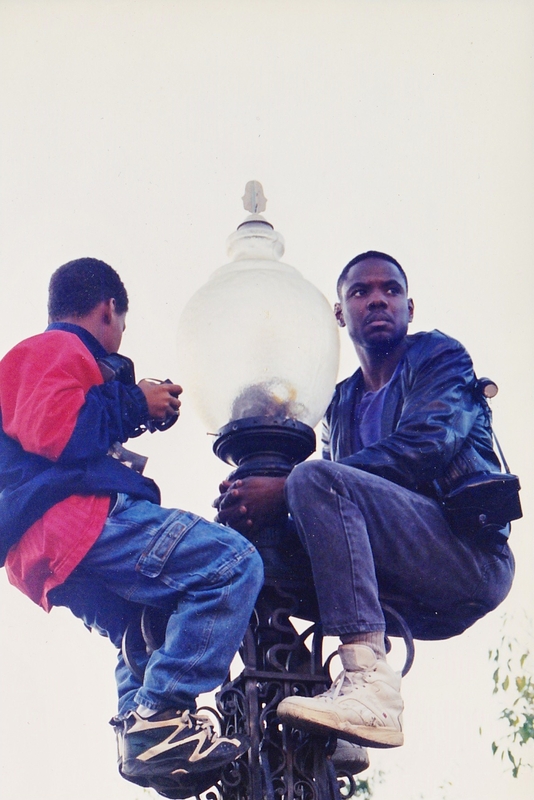 Two boys climb city light to see. In 1995 I remember receiving several calls in late September from a few friends and colleagues asking me if I were going to Washington, D.C., the following month in October. My first thought was the Black Church and clergy were being asked to participate in some political cause of national consequence within the Black community. I hadn’t been paying much attention to the Black news media because O. J. Simpson had just been acquitted of murdering his wife, Nicole Simpson, and the case and verdict was still fresh on the minds of the general public. It was called the trial of the century. White people were angry and once again the black man was the evil pariah that was destroying American society. I was skeptical at first, considering Louis Farrakhan and the Nation of Islam were at the center of this movement. However, as the news media continued to portray black men in America as violent, fatherless, abusers of women, rapists, and murderers in society, I felt I wanted and needed my voice to be heard. I wanted to be among a chorus of like voices that would sound the trumpet to action and change. The event immediately became larger than any one person or organization. Louis Farrakhan and the Nation of Islam were not the focus; the focus was upon showing our nation a more positive image of black men in America. There was a spiritual component to the movement that welded the entire event together. The event was also called “A Day of Atonement.” Speakers addressed the congregation of black brothers on themes of reconciliation, atonement, and responsibility. We were one church on that day. It was a beautiful tapestry of black men, young and old from all walks of life that came from every part of the nation to share our collective stories and testimonies of struggle, pain, and rebirth. There was no violence. There were no riots; just brothers caring for brothers. I didn’t know what to expect when I got on the plane the day before the event. All I knew was I needed to be there. There was silent hope as I walked nearly three miles from my hotel to the National Mall. It was early morning, around 4:00 a.m., before the sun came up. Silhouettes of blackness walking silently down opposite walkways towards the Nation’s Capitol like expecting souls on their way to a revival. We greeted, embraced, and welcomed one another like brothers once lost but now found. I cannot tell you the spiritual transformation I felt as I stood for hours being baptized in a sea of blackness. The currents of change were felt across the nation, at home, and in our communities. There was a feeling of hope in the air. was announced at the Trayvon Martin trial on July 13, 2013, there hasn’t been a day gone by that the news media, blogs, pundits, activists, and media outlets haven’t had something to say—pros and cons—about the trial’s outcome. Racial tensions are thick. People are angry and the nation is divided along racial lines. The conversations and debates are heated, and it doesn’t take much for violence to erupt and be fanned by the flames of hatred. Once again, race and the black man are at the center stage of the controversy. The question has been raised by civil rights leader, black politicians, scholars and intellectuals, black journalists, clergy, and others about what to do next? Should we boycott Florida? Should we fight to overturn “stand your ground laws” in states that support them? Should we march and stage protests of civil disobedience? Journalist Roland Martin suggested and stated, “I believe that we need to have a 21st century student nonviolent coordinating committee” in major cities across the U.S. like the ones during the civil rights days of the 1960’s to fight injustice. I would suggest however that our national black leaders first come together to discuss strategies, action plans, and ways to mobilize African-Americans to fight injustice like the leadership did for the Million Man March. In my opinion there is a national African-American leadership disconnect between the Black Church, academia, politicians, and the Black community. Before we can make any definitely lasting change in this nation, we must come together and agree—at least in principle—what the next step should be. Lately, there has been a lot of unwelcomed change that has affected our community that we have blindly allowed to infect us because of our disunity and disconnect. One of many positive things the death of Trayvon Martin did was to waken and mobilize us into action. “. . . a movement occurs when widely scattered people begin to realize that they share a common burden. The key word . . . is burden. A particular burden is placed on a few people’s minds and hearts by the Holy Spirit. They gradually begin to discover one another, although they are separated geographically. As they communicate with each other, they form a core of burdened people for a particular need or cause within the Body of Christ” (“What Is a Movement?” by Bill Waldrop, Executive Director of ACMC Newsletter, Autumn 1991). I submit that there needs to be a burden before there can be any action (not just a reaction). 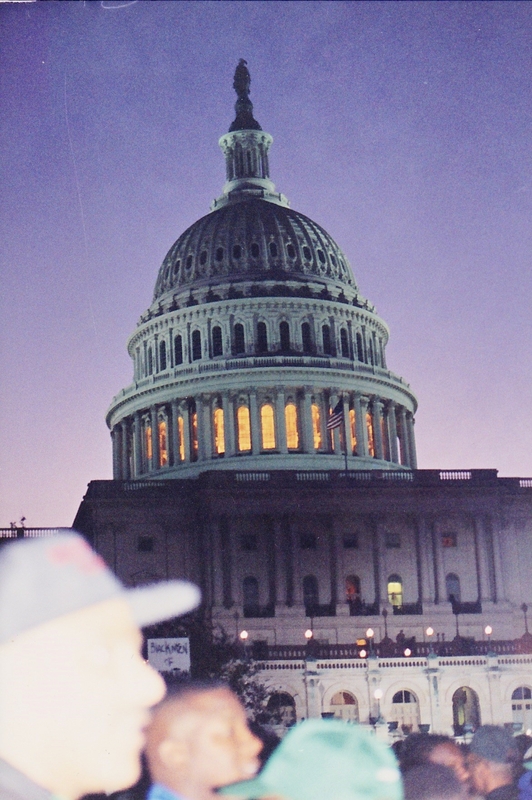 Million Man March, 1995. At the Nation’s Capitol for early morning prayers. There are few universal biblical principles that can be learned by secular as well at the religious community as we consider the need of a collective movement or burden to a cause. First, there must be agreement. The prophet Amos said, “Can two walk together, unless they are agreed?” (Amos 3:3). Secondly, the apostle Paul makes a plea to the Church that as a community we must be “perfectly joined together in the same mind and in the same judgment” (1 Corinthians 1:10). Allot time and space in their conventions to encourage constituents to become engaged in social justice and to fight against social injustice. Make education and the economy a part of the Church’s goal to help rebuild the Black Family and our communities. Develop an outreach plan and strategy to reach our young black men in our communities. I believe we have run the gamut of praise and worship conferences, making the latest worship CD’s, district, state, and national conventions that focus on buildings and budgets (inward) and lacks a missional focus that equips our members to do the work of ministry (outward). While thousands may gather at conferences to praise “woman thou art loose” millions of young African-American men are yet chained by racial stereotypes, poverty, and ignorance that keep them bound. It’s hard to have a praise break when there are young men like Trayvon Martin dying in our streets.